Anxiety Issues or Taper Madness? Holy crap, I’m freaking out! 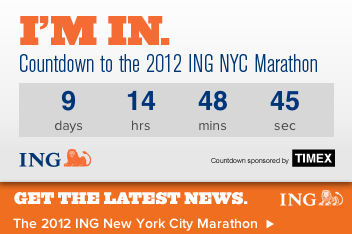 There are nine days until the NYC Marathon and two days in a row that I have had some major anxiety issues about the darn thing. This is new to me. I didn’t feel anything about my first marathon until about 3.5 miles into the darn thing and I never felt anxious about my second marathon. But I’m kind of freaking out about this one. During my first two tapers I only really experienced some achiness in my legs, I’m not even sure if they were real or not. But that was the extent of it. I didn’t have any major mood swings and no strange dreams where I’m running naked to the start line after everyone has already left. So these two panic incidents are strange to me. For someone who pretty much stays level headed through much of everything, aside from a few grumpy moments here and there I don’t really know how to handle these things. Yesterday’s panic moment came when I was trying to figure out when I was going to fit my daily run in. I had that scary thought that I hadn’t trained enough or that I didn’t run enough recently. Both are insane ideas. Today’s panic was that I need more than nine days to prepare for this race. Again, completely insane. Being the cerebral nerdy person that I am it is important for me to try and figure this out. So far the only conclusion is that this year I’m running for my mom and not just myself. Back in January my mom wanted me to run this marathon, I said no. Then she got ill and that changed everything. I’m not running this marathon out of guilt, I’m running it because she can’t and others like her can’t. My mom is finally home and the anxiousness I was feeling before then has dissipated and perhaps transferring into marathon anxiety. Believe me, I’ll take that. In the meantime I’m thinking about my annual letter to the marathon and finalizing my list of people I dedicate these 26.2 miles to. There are so many people who have made an imprint on my soul this past year and this is my best way to honor everything that they have done for me. Perhaps because of what they have all meant to me I’m feeling a little more pressure to do well for them. Most of my major marathon prep has been taken care of and that is a huge relief. I’m looking forward to running the NYRR Poland Spring Marathon Kickoff race in Central Park on Sunday and of this Hurricane Sandy messes it up I’ll be pissed. I think getting in a race this weekend will help get some of this nervous energy I have out of my system. I really hope so. This entry was posted in NYC Marathon, Races, running and tagged NYC Marathon, NYRR, Poland Spring Marathon Kickoff, Running, training. Bookmark the permalink. 1 Response to Anxiety Issues or Taper Madness? You ARE ready! Have a good one! I’m looking forward to the post!